Immediately after I sang the song, or rather a few days thereafter Unni anna messaged to say that it has come out very well. Harris sir said he was pleased. As far as I am concerned I have been looking forward for the release of this song from the day it was recorded. While working on the cover of Inbox 1305, Mrs. Kiruthiga Udhayanidhi happened to mention that she loves the song. Didn't stop me from asking her if she, by any chance, carried a rough mix of that song in her car. She mentioned that Harris sir does not give the song to anyone for any reason. And then a week ago I was told to host the audio release of Aadhavan. First thing I was all jittery. Hosting a show on TV is a completely different ball game and hosting a live event is something else. Totally. You may plan a live event to the last detail, but its almost like such events have a mind of their own and they make their own plans. I had no clue what I would do if I called someone with the wrong name, or title, made slip-ups, messed up... hohohoho.. Was even wondering how damage control would happen, what if I angered someone.. all worst case scenarios flashed across my mind's eye. I kept badgering the PRO Nikhil Murugan for a minute to minute briefing, how to invite the dignitaries and the guests as being a newbie I was not at all confident of the protocol and how things are done. K S Ravikumar sir agreed to meet me and he explained how the proceedings should go on and one more meeting happened yesterday morning with the Producer Udhayanidhi Stalin and KS Ravikumar sir and his team. At the venue, I was able to watch closely how K S Ravikumar sir gave out instructions, how he planned the event and his inimitable style and sense of humour. Even during the first meeting that was fixed, he explained some intricate details of film-making and how things are done as he would to a student and so patiently that I felt darn lucky. I had a few last minute questions that only Nikhil Murugan could answer and he let me know on the protocol and a lot of other finer details. Maybe for one of the first times there was a Nadhaswaram group playing music and everything was set traditionally. Sure I had my slip ups but thankfully there is leeway to apologize on stage. Sometimes while I spoke I kept hearing my voice back in delay and that made me mess up a couple of words as well. When you catch it on TV you'll know what I am talking about. Vivek sir, was very kind to mention me in his speech, which I have seen that he always does, if I have sung at the start of the function. But what was most touching was when K S Ravikumar mentioned me in his thank you speech and also said he believed that Vaaraayo was his favourite track. At that point in time I know how much I thanked God for having brought me that far to be acknowledged by stalwarts in the industry. In all this there was this one person who hardly made his presence felt. The producer. Every one who spoke on stage yesterday said how extremely simple he is, to the extent that perhaps it gives simplicity a new meaning. I was stumped when I saw it in Kiruthiga while working with her for Inbox 1305. And though I had heard it from several people before, it is just plain - (for want of a better word) wonderful that a power couple are this simple. When I heard the song again on the way back there was this joy and immense gratitude to the composer who chose me to be one of the voices for his song. When I sing, I give my life for it. I have yearned for every song that I sing like you can never imagine. If there is something that I am truly madly and shall perennially be in love with, it shall be music. For ever and ever. There have been days when I felt that my being was twisted so much that it cannot withstand anymore. And there are days when I felt as if my being somehow expanded that it encompassed the entire universe due to the joy that was given to me as a blessing. So much that I loved every being in it. The wise say that this state of mind should be constant no matter what the situation. But then, I am neither wise nor a saint. But some day I ll perhaps get there. Before you wonder, I just meant I ll get to the point of being wise someday. Maybe not a saint. And to you, reading this post, I wish for you that may you feel the joy that I felt, may life offer you such gifts, wherein you experience every pore of your being brimming with joy and perhaps something like being one with the universe. I have lived it. And wish you do too. i waiting for songs from adhavan,few times i mail to u but not recieve any reply.if u have time please reply me. Songs are really very nice.Harris having his own trend,no one can beat him on his trend. Ur voice going to be in all FM's for every day. All the best for ur carrier..! btw saw d pics on galatta.. u lukin pretty! plus d saree :) get goin lady!! 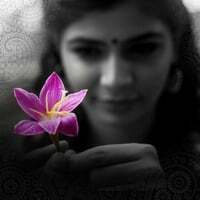 i am waiting to see the movie release..
Hi Chinmayi... its such a beautiful song.. great combo of you and unni sir. i love this song... thanks for such wonderful renditions..
Wow. Will look fwd to watch it on TV. I really love that song. The combination of your voice with unni sir was really tuned so nicely.. Cant stop hearing it.. Keep the good work going.. I was waitin 4 u to write abt this.. many congrats.. thank you for the end note.. its plain wonderful ;)!! And may your life be replete with such wonderful moments.. and may u reach newer heights, in an ascending order .. always..
Let there be a life long love affair with the Universe and its unbelievably positive energy!!! Following your song in Madurai Sambavam. Aadhavan song is also very good. Heavenly voice of yours keeps all my worries and stress out of my mind. I loved the song! Can't wait for kanden kadhalai heard you are dubbing for Tamanna! The song is good - but probably will be enhanced when i see the video. was this almost like the wait of your first song? How was it then - it was probably a year ? Did you get to know Mr. jayachandran was singing a version as well? and btw: personally do you like yours or his version? This is Jana here. Just started to follow your blog. In fact your blog inspired me to start my own blog "http://janas59.yolasite.com". I wonder how you write soooo much in your posts. I am a great fan of your voice. All your songs are amazing to hear and your voice that you gave to some actress (dubbing) is also presentable. I know dubbing is not an easy deal. You are doing it so fine. And coming to your post topic - your latest song in Aadhavan. I haven't listened to that yet. Will definitely do. I have no doubt it will be damn good. Looking forward to your future songs. All the best and Godspeed!!! Listened to "Vaarayo" and "Laesa Parakkadhu" back-to-back. Sometimes you are left with no words to express. Simple-a sollakkoodiyadhu Super!!!. Here's wishing that you sing many many more songs and keep delighting us. Also wish that you remain hale and hearty for eternity. "If there is something that I am truly madly and shall perennially be in love with, it shall be music. For ever and ever." It just express about the indefinite love of yours towards music. You give ur life to the song to touch all our soul. It may sound mad that even I am interested in learning music[even after graduated in Technology background], but I am interested in music. Music and Dance are two art forms which always excited me and forever will excite me until my last day. Congrats...for ur Vaarayo song and ur voice is like a morning breeze....Usually we can judge the voice of person based on his/her personality up to some extent...but ur voice is totally a unique one. Chinmayi! Wow! Vaaryao vaarayo..thats a heart melting one specially in combination with Unni Krsihnan. Truly its the pick of the lot. I loved it!!!! I can't imagine the kind of gratification you must feel when you listen to your voice streaming out of the radio or TV. I personally love your singing Maiya maiya from Guru. Lurve, lurve, lurve it..can't just stop with one time. Song came up very well. You are rocking..Voice s amazing.. all the best for future project. Saw your profile in which you stated you liked reading psychology books. Can you recommend me the best psychology books that you have ever read? Hi, Chiinmayyi akka you have singer wonderfully in the adahavan song akka.you have done well akka.moreover its been for your experience to be the host for the audio launch in the adahavan song akka.sure you get lot of experinces akka.anyway gud luck akka.im from malaysia akka.my name is thilak.i want to be a singer one day.and i hope my wish can come true akka.may god bless you akka.Thank You.Jai Ho! Congratz Chinmayi. I am happy for you! Really a nice song! I liked it. not again..... Please let us do our work.... I have responsibilities... You are just ... awesome. Its not just i'm hearing it... Some voice is echoing within my head.. Thanks a lot..
You mentioned in your blog that you don't like hosting live function. What made you to accept this Aadhavan Audio Release function? U sang very well...really we(my family & me) enjoyed it. Just listened to this song.. It was awesome! I'm a born again fan of yours! I heard the song last week it was superb melody. Waiting to hear more of you and unni combination in future. U seem to hav a magnetic voice that adds soul to every song u sing..
To say in short, U ROCK !!! No more words to describe..
Unni sir's voice is already like a honey dripping cake ! Ur voice wuz like the Topping of it! As always , U rock.. The songs opening music was so cool. I Never came to this site..
Heard Lots of your songs many times.. they were good. however never bothered to know abt you. BUT Vaarayo...somewhere struck the last string in my soul and iam obsolutly clueless on what this song has done to me with your voice.. Soon felt totally interested to see the person who owns such a voice and hence visited wiki and then ur blog..
" Naan Mudhal mudhalaay ezhuthiya...." wow those lines kill me all the time.. The song is awesome... Keep the good work going. Oh!! The song is just amazing. Am a fan of you yourself. Be it singing or compering. You are doing great job dear. God bless. நான் சொல்ல நினைச்சது எல்லாத்தையும் பிரியமுடன் வசந்த் சொல்லிட்டார் .. I have a habbit of guessing the voice of singers. But, I never new that u can sing in this manner as well. I'm comparing it with "oru deivam thanda poove"... Man!! I can't believe both were sung by you... Completely different. Awesome. God bless u.
Enthralling music & an enchanting voice. but u sang "Marilyn Monroe" as "Marilyn MAnroe"